On Hauptwerk forum: Grosshartmannsdorf now available! On Hauptwerk forum: Any interest "Yet Another Silbermann"? Review in German on Orgelbits. 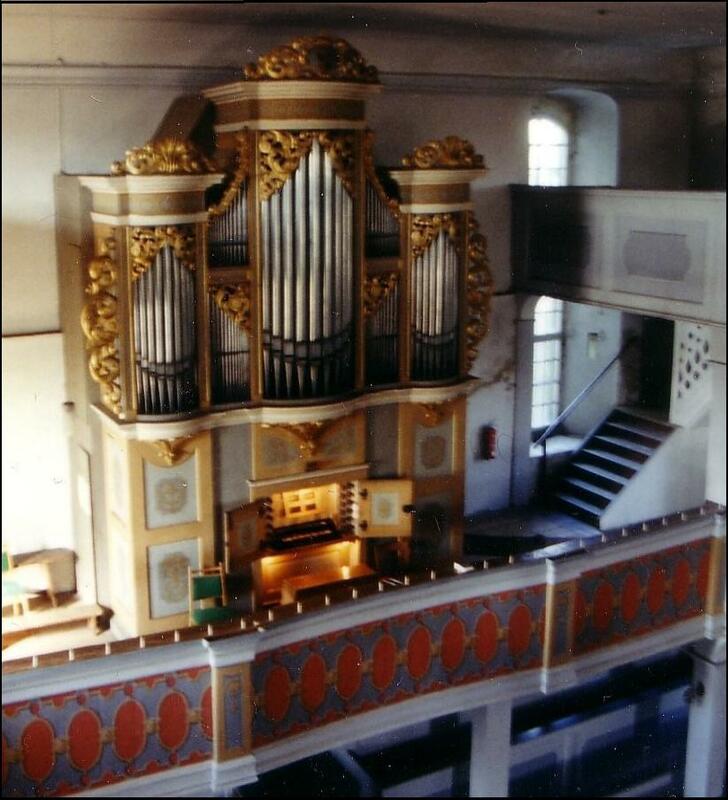 Gottfried Silbermann built, during his lifetime (1683-1753), about 50 organs; there are already five of them available in Hauptwerk. Because of this organ doesn't contain reeds (except Posaunenbass 16 in the pedal) and strings, it is especially suitable for baroque music. 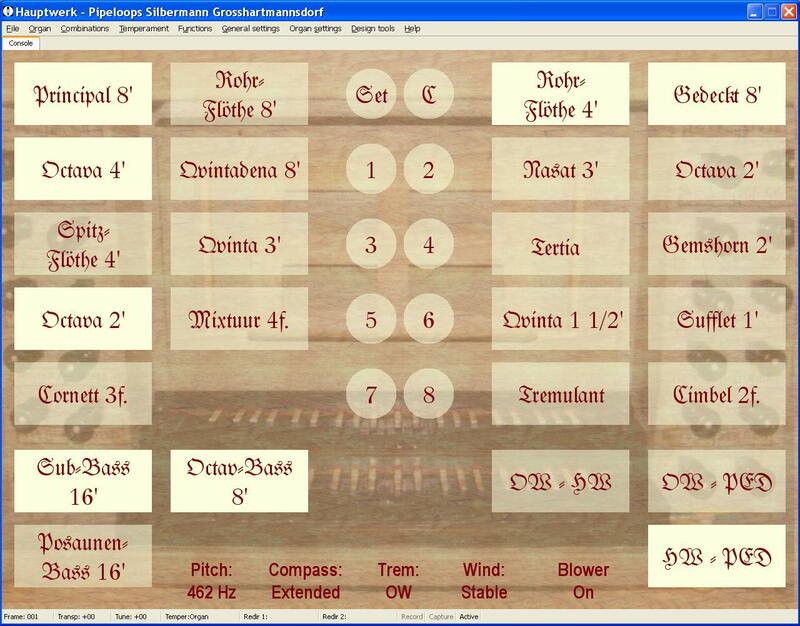 Although the church in Grosshartmannsdorf has small acoustics (about one second), feels this sampleset clear 'Wet'. In other words, this sampleset sounds through the small acoustics not hard/cold and dull but beautiful transparent and clear. Listen to the mp3 examples to hear that, or download the free sampleset and try it yourself. The hauptwerk has a beautiful 'blowing' Principal 8, the Octava 4, is in my opinion a bit too loud. I don't know the volume of the Octava 4 on the real organ, but the sampleset producer said to me that all stops are recorded under equal conditions. The 3 strong Cornet sounds wonderful, you can supplement it with 'Principal 8 and Octava 4' or 'Rohrflote 8 and Spitzflote 4'. The nice 'round' Nasat 3, but also the Quinta 3 can be used for a 'solo registration'. See for other registration examples the demonstration pieces below. The Subbass 16 in the pedal is nice soft, when you want a stronger pedal then you can use the OctavBass 8, Bass Posaunen-16 or one of the couplers. You can download the complete sampleset and try it for free; the only restriction is that the sound dropped every minute a few seconds out. The wind motor sound (blower) can real time be switched to on and off. The good readable and practical stops page is available in two resolutions: 15" and 17". The contrast between 'stop selected' and 'stop not selected' in the stops page is not very clear when a lamp shines on the screen. There are extra couplers added: Ow-Ped, Ow-Hw. Very handy and practical. Change the pitch from original (462 Hz) to standard (440 Hz). Switch the 'wind model' on and off. Use 8 free configurable combination stops. Choose to apply the tremulant for the full organ or only for the Oberwerk. Why not two tremulant buttons? Change the manual compass from 'Original' to 'Extended'. The recorded samples of this organ are very long (8 seconds, 15 seconds for pedal stops), this increased the realism. It is unfortunate that of this historic organ no sounds are recorded of 'keys', tremulant motor and pulling out the stops. The license of this sampleset has as restriction that it is not allowed to use it in a church; also you may not publish recordings. Hauptwerk Advanced is not necessary for this sampleset (because of the polyphony and also is the impact of the windmodel very small for this sampleset), it is sufficient to use Hauptwerk Basic version. Moreover, this sampleset doesn't have high computer requirements: 1700 MB RAM (including the artificially added staccato and portato releases) / 1100 MB RAM (with single releases). For people who search a baroque sampleset with practical features and have a computer with maximal 2 GB of memory, this is a fine set.